Chances are, as you look at your calendar of scheduled professional learning days, you aren’t overcome with excitement. Traditionally, teacher professional learning has ranged from the good (the workshop that’s actually hands-on), to the bad (the never-ending PowerPoint presentation), to the ugly (remember that one presenter . . . ). But, as the Common Core State Standards become the norm, the new standards and the expectations around problem solving and critical thinking are prompting a new look at teacher development. In the process, more districts and schools are thinking of ways to make professional learning meaningful and engaging. The biggest challenge in teacher development isn’t teaching teachers something new, but ensuring that knowledge and skills are applied in the classroom. A 2013 study by the Center for Public Education found that the majority of teacher development has been ineffective at changing instructional practice and improving student learning. Still, CPE argues that the Common Core demands effective professional development that directly links teacher learning with classroom instruction to help teachers meet the demands of the new standards. Fred Hang, Great Books Foundation senior consultant, has a simple litmus test for professional development, “Don’t bore me, don’t waste my time, and don’t talk down to me.” Above all, professional development should be useful, engaging, and applicable. As you prepare for the Common Core, look for professional development opportunities that incorporate these best practices. Similar to an ideal classroom in which students are doing the heavy lifting, in an optimized training, you’ll be doing the work. In Great Books courses, for example, instead of sitting and listening to an expert speak for hours on end, teachers begin to plan and lead their own discussions right away. During the course, teaches are engaged with the methodology that they are learning, says Linda Barrett, another senior consultant for Great Books, which makes the work stick. Right now, there are a lot of people talking about the Common Core State Standards without the true background knowledge of what they entail. If a professional development opportunity advertises itself as “Common Core-aligned,” be sure to investigate what that really means. In order to improve your teaching, you’ll have to change your behaviors in the classroom. For example, Hang focuses on teaching teachers how to listen within the thinking process. “You can’t discuss if you’re not willing to listen,” he says. Even if a strategy seems off base to you or like it won’t work in your classroom, sometimes it’s worth it to give it a shot. If it ends up surprising you, wonderful—and if it doesn’t, the failure can often add to your understanding of what your students need and why. The Center for Public Education found that the professional learning that was the most effective incorporated follow-up services, including coaching or mentoring. Change takes time, so professional development should continue throughout the school year. As you progress through professional learning, think about how the strategies will apply on a practical level with your higher-ability students, those in the middle and the ones on the lower end. What techniques will you need to tweak for each group and why? “Sometimes our poorest readers are the best thinkers,” says Hang, which is why he encourages teachers to incorporate opportunities for students to talk and think before and during reading. In any professional development, ask about how to address students with ELL or special education needs, or other populations in your classroom. Technology is a crucial component of the Common Core, your classroom and your students’ lives, which means it should be a part of your professional learning as well. When pursuing a professional development opportunity, in addition to understanding how technology can support students’ learning in the classroom, check to see what resources are available to support your growth as well. 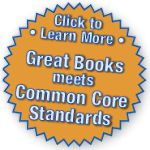 Recently, Great Books has added online options for schools and teachers. There is now a blended version of their core course, which incorporate one–day of in-person training with 4 hours of online material that is designed to support teachers’ development in the application of Great Books strategies. In the online portion of the training, teachers learn more about Shared Inquiry, apply it in their classrooms, and then provide feed- back online before moving on to the next step. Quality online professional development can provide the ongoing learning and reflection that can help make a one- or two-day workshop leave a lasting impression. Reflection allows us to make sense of our learning, and incorporate that learning into our understanding. Professional development should provide time for individual and group reflection that helps you solidify and crystallize what you learned. After Hang teaches a course, he often hears how surprised teachers are at what their students can do. “Before a course, teachers might say ‘my kids aren’t there yet,’” says Hang. “But after they take a course and use our programs in the classroom, teachers find out what their kids are truly capable of, and there’s always a level of astonishment.” Professional development should continue to bring new realizations as you incorporate it into your practice.